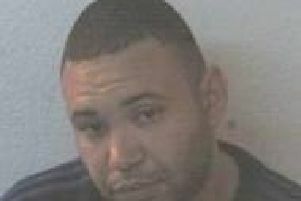 The apology over the investigation into an unprovoked attack on Lawrence Vincent in Balby, Doncaster in January 2017 was received by his mother Diane Timms just hours after The Yorkshire Post published evidence she had compiled that highlighted a series of failings in the handling of the case, in which no charges have been brought. These included officers failing to order forensic analysis of a footwear impression on clothing Mr Vincent had been wearing when he was attacked, as well as a failure to seize the mobile phones of suspects despite a social media image of two individuals wearing hoods and captioned ‘No face, no case’ being posted online shortly after the incident. Lawrence Vincent, pictured shortly after the attack in Januaru 2015, was left with serious injuries. The letter sent to Ms Timms confirmed the investigating officer in the case, a police constable, has now been placed on a mentoring programme and action plan “to ensure these failings do not happen again”. The letter said the officer should have checked the clothing for potential forensic evidence and “a mobile phone strategy should have formed part of the investigation and subsequently searches made in relation to mobile devices”. South Yorkshire Police said last year that six teenage boys had been interviewed in connection with the case but never told the family how many arrests had been made. The new letter confirmed only two of the six were ever arrested - one of which was because the suspect had refused to attend an interview. Mr Vincent’s mother had previously raised concerns about the number of house-to-house visits to find potential witnesses that had been carried out and police initially told her that the officer said he had visited 13 local properties. However, when Ms Timms went to the same properties herself, she said only one resident said they had been visited by the police, with nine saying they had not been visited at all and there being no answer at the three remaining properties. The new response by the detective inspector overseeing the complaint said: “Some of the residents deny having been spoken to. Having sought clarity from the investigating officer, it appears that during the initial house-to-house enquiries, the investigator did not manage to speak to all residents, due to no reply. However, what I have been unable to clarify is if and when the investigating officer re-attended to finalise these enquiries. Ms Timms said she was pleased to have finally been vindicated but remains angry at the way the case was handled. She said: “I’m a little bit happier but obviously it shouldn’t have happened. I shouldn’t have gone through months of hell to get to the stage I am now. It is what I have said all along. “They bagged up his clothes for ten months and did absolutely nothing with the evidence they had sitting there. “There is still anger there. For over a year, they never answered a straight question, everything was twisted all the way along. There were many times last year where I didn’t want to wake up, I felt so ill. I thought I was going mad with it all. She said she hopes the ruling means any further allegations involving this group of teenage boys will now be dealt with properly by police. A spokeswoman for South Yorkshire Police said today: "Following a complaint to South Yorkshire Police, officers conducted a review of the investigation of an incident, which occurred on Saturday 28 January 2017 in Balby, Doncaster. "The review found there were failings in the initial investigation including forensic and telecommunications, and a failure to follow-up with residents who did not respond when initial house-to-house enquiries were carried out. "South Yorkshire Police apologises for these failings and the impact felt by the victim and wider family. "South Yorkshire Police aims to deliver an excellent victim-led service and acknowledges this was not achieved in this instance. The initial investigator has been placed on a mentoring process and action plan to learn from these failings and wider learning has been shared across the force to ensure this does not happen again."